Smartphone buyers can pre-register when a new model comes out, assuring that those interested in the handset receive a notification when the device can be reserved with a pre-order. Now, Google is allowing developers to offer Android users interested in an upcoming app, the ability to pre-register for an upcoming release. 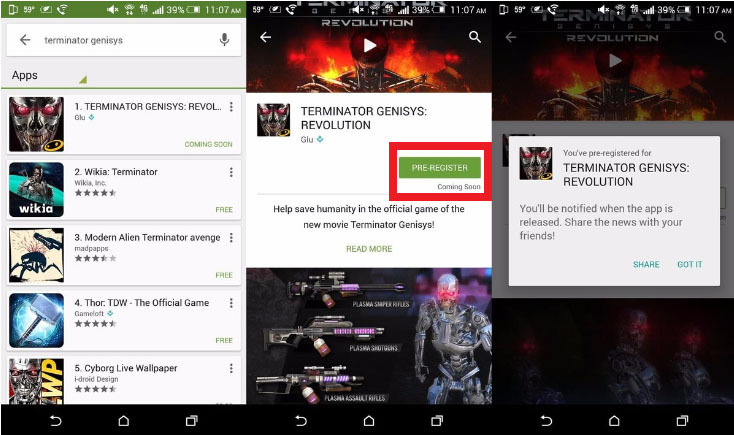 Glu Media will soon release its "Terminator Genisys: Revolution" third-party shooter game. Android users interested in purchasing the app have the opportunity to pre-register for it. Once the game is released, those who pre-registered will receive notification of its availability on the Play Store. And if you change your mind before the app is launched, you can unregister as well. For developers, this gives them a way to measure how much demand there is a for a new app before its release. And by reminding forgetful Android users that an app they were interested in is now live, it might help bring some revenue into the developer's coffers that otherwise would have ended up in a cash register at McDonald's.